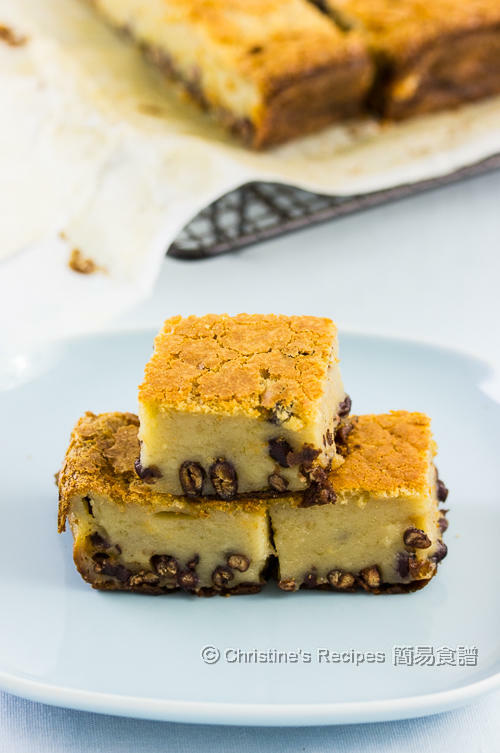 The texture of this red bean coconut cake is a bit chewy, yet soft and smooth enough for easily digesting. The taste is so delicious. I especially love the crispy edges. This coconut cake is best served warm or hot out of the oven. 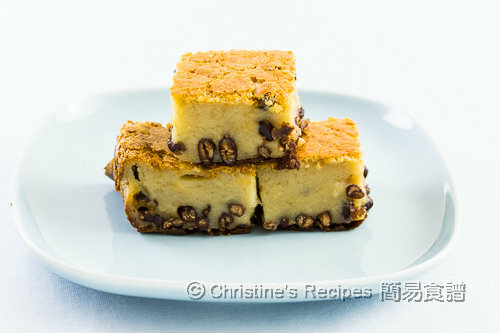 During the busy Chinese New Year’s celebration week, we have lots of different cakes (gao 糕). Yes, we can’t celebrate without all the traditional cakes, radish cake, taro cake (aka yum cake), sticky rice cake and water chestnut cake. Except for all these must-have cakes, I pretty like this baked coconut cake. To make this snack, you simply mix all ingredients together. Then bake in an oven. The batter is not tricky. You won't go wrong. By adding some home-made red beans, just cooked to near-but-not-yet breaking apart level of keeping their whole shapes, the cake turned out perfectly for my family. Any leftovers can be stored in a fridge for a few days in an air-tight container. Simply reheat it in a low-temperature oven for 10 minutes or so. It tastes equally good. I served the reheated cake for my daughter the other day as a treat, garnished with ice-cream and fruit salad. Got thumbs up! Preheat oven to 180C / 356F. Line the tray with baking paper. Beat the eggs with sugar. It’s no need to beat too long. Just combine and make sure the sugar is dissolved. Add coconut milk and milk. Mix in glutinous rice flour, one or two tablespoons at a time until the mixture is smooth. Add vanilla extract. Mix in the cooked red beans. Pour the batter into the lined baking tray. Bake in the preheated oven, on the middle rack, for about 45 to 50 minutes. If an inserted needle or skewer comes out clean, it’s cooked through. Let it cool on a wire rack for 5 minutes. Serve hot or warm. Add the red beans in the very last step. Then don’t over mix them. 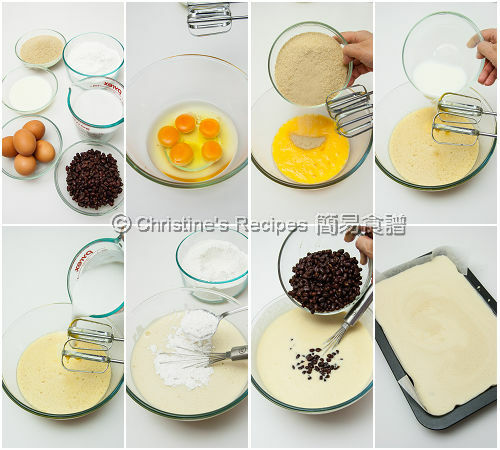 Otherwise the red beans will break apart and make the batter become red in colour. The red beans are heavier as a result that they might sink to the bottom. I used fresh milk. You can substitute with PTU milk, or rice milk if your family member is allergic to milk. To get the best results, try to get raw sugar because of its natural golden colour and aroma are the best. You can use white sugar instead anyway. Use a large shallow pan / tray to bake this cake because you don’t want to bake for ages if the batter is too thick. You might use the store-bought sweetened red beans, available at Asian grocers. I am having my afternoon tea now...wish I could have a slice of this delicious glutinous rice cake! Hi christine! Can I substitute raw sugar with coconut palm sugar 1:1 instead? I have some in the cupboard and don't want to waste it. Think that you can replace with palm sugar. Yet, I haven't tried and tasted how sweet it will be with this recipe. Can't tell you the exact amount. You might like to try a bit less than 1:1 first and see if the batter has got enough sweetness or not. Yes, you didn't read it wrong. Taste the batter. Then you can grate and add some more palm sugar if necessary. No need to add oil. Coconut milk contains some oil already. Dear Christine, is the cake supposed to be sticky? Mine is, and I wonder if it's not cooked enough. I baked for 40 minutes as my oven gets hot quickly. But the cake tastes fabulous. Not too sticky, the texture like mochi. Hi! May I know how much sugar and water do u use to sweeten the red beans? Sorry, first time cooking red beans here! Also, I just bought your cookbook via yesasia and wonder if your cookbook has more recipes than online? Sorry, haven't written down how much sugar I used to cook red beans this time. You might use the store-bought red beans. Very handy. Thanks for your support of my cookbook. There are some new recipes in my book that I haven't published on my blog here. Do you use full-fat milk? Do you think it will work with nonfat milk? It'll work too if using nonfat milk. Aww mine came out flat :( how come?? This cake won't puff up like a chiffon cake, nor shrink at all. Do you include the egg white too? The picture shows so. Yes, used 5 whole eggs. Can I use milk powder? Do you mean melt milk powder with water, then replace it with milk. I made this yesterday. Your recipe was great and although we could not find raw sugar or sweetened tinned red beans and had to cook them from scratch, it was absolutely worth it. We just loved it and will definitely make this again. Thank you. Good on you. You managed to make the red beans from scratch. Couldn't agree more. It's worth all the effort. This dessert is always a big hit in the family. So glad that you liked this recipe. Exactly, we just love the texture you described.